Sausage is an underrated art form. The savory sizzle and pop of the casing that gives way to melt-in-your-mouth juiciness, just bursting with flavor – we’re lucky to have a local sausage expert right here in Southern California. This week, we had the pleasure of talking with Helki Zeigler of Zeigler Sausages. Helki, like so many of our farmers, artisans, and customers, is passionate about ‘the real’ – real experiences involving real food from real farmers. In 2012, after 15 successful years as a senior level marketing executive, Helki was ready for a move towards ‘the real’. She was missing the fire and drive she hoped to feel in her corporate work, and she began craving a connection to something bigger. Knowing her biggest passions were travel and food, she began saving up money from her career to follow her dreams. Her interest in food, sustainability, and the local community, sent her on a path back to her past, to a family tradition. See, sizzlin’ sausages are in the Zeiglers’ blood. Helki’s parents were founders and owners of Seattle based company, Distinctive Sausages by Zeigler. Her father had even been mentored by Rytek Kutas, a legend in the sausage world. His book, Great Sausage Recipes and Meat Curing, is often referred to as the “bible” of sausage-making by those in the know. “I grew up making sausage.” As a child and teen, Helki spent many hours helping out with her parents’ business, developing a deep love and respect for the craft. 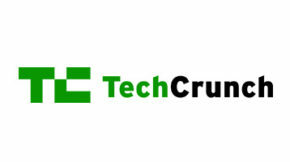 When she finally decided to leave the corporate world behind in September of 2012, her path was clear. 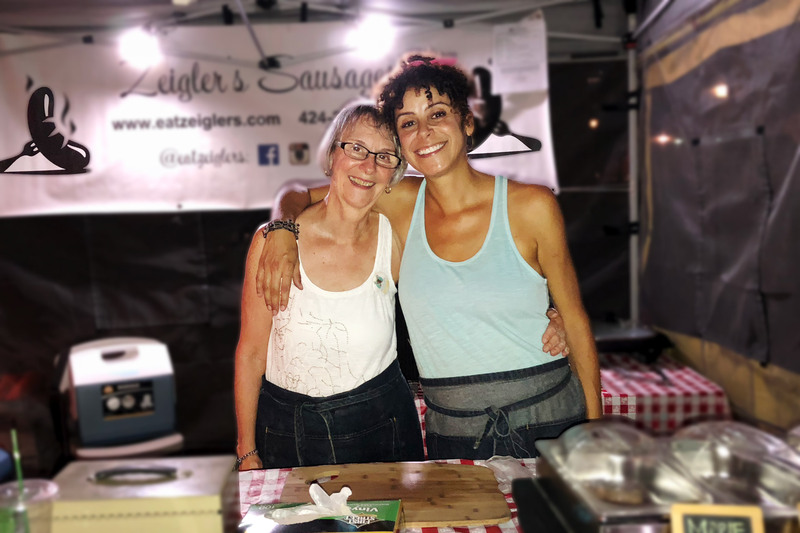 “As it turns out, I also have a passion for making (and eating) delicious sausage, and I knew that I could offer an artisanal product that was a step above the rest.” And she was right. 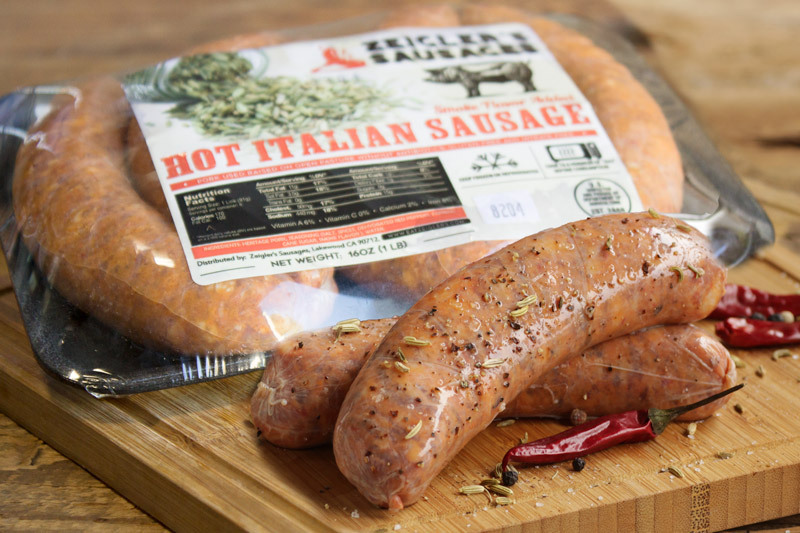 Zeigler’s sausages are undeniably unique, both traditional and surprisingly simple. The real ‘cut above’ is in the quality of meat. 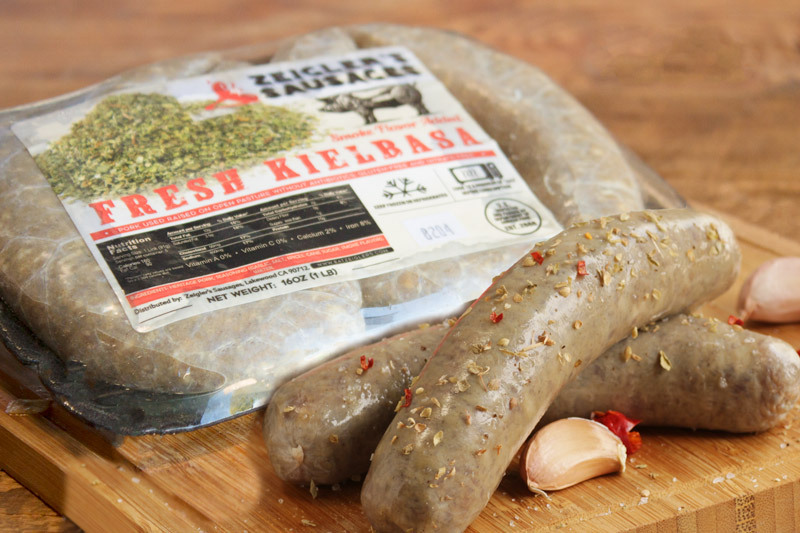 When Helki began Zeigler’s Sausages, she knew from experience that the best sausages would require the best meat. That’s why Zeigler’s only uses pasture-raised heritage pork. 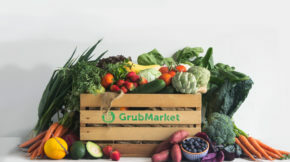 As a conscientious consumer in the pursuit of the best local and organic food, you may already be familiar with terms like ‘heirloom’, used with items like tomatoes or garlic, or ‘heritage’ in reference to beans and grains. Well, in the pork world, the term ‘heritage’ is no different. The classification is just as important, not only for flavor and health but sustainability as well. Even the highest quality conventional pork found at supermarkets is neither ethical, humane, nor sustainable for the environment. Before the recent boom in industrial agriculture, heritage pork would have been an unnecessary classification. In those days all pork came from pigs who were raised on small family-farms, free to roam in the open air and graze on grass, grains, and whey. These breeds were brought to the Americas from Europe and enjoyed a pleasant life in their new pastures. But as the demand grew, so did the industrial pork business. These small, natural, European breeds, as well as their idyllic way of life, was no longer profitable. As the living spaces became more and more confined, the industry began breeding pigs who were more tolerant of the restricted area. And so it went for many years, heritage pig farming nearly forgotten, until a recent boom, led by chefs, began demanding a natural meat resurgence. With Top Chefs leading the way, heritage pork has slowly begun gracing plates across the country. As more and more people fall in love with the undeniably better flavor, demand grows. What makes Heritage Pork healthier and more sustainable? 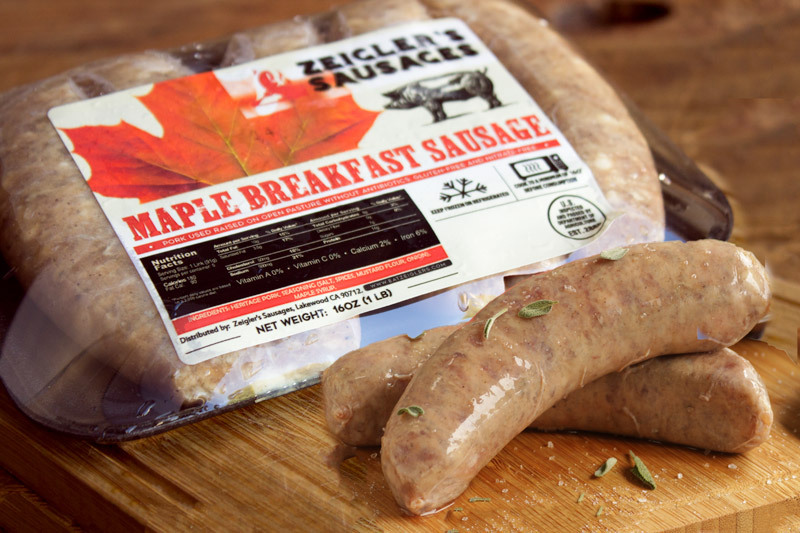 With all that in mind, it’s no wonder that we love supporting artisans like Zeigler’s Sausages. Committed to flavor, sustainability, and ethics in their meat, Zeigler’s only sources through Heritage Foods USA, created in 2001 to protect endangered heritage breeds. The pork Zeigler uses comes from directly from three farms, Newman Farms (specializing in heritage Berkshire Pork), Lazy S Farms (specializing in purebred Red Wattle pigs), and Good Farms (specializing in Duroc pigs). And on top of that, Zeigler’s Sausages utilizes all of the heritage pork trimmings. 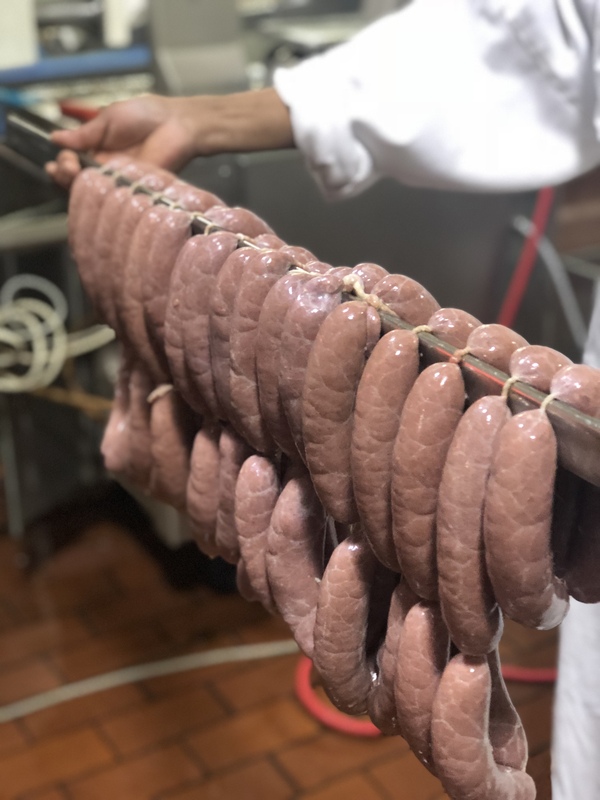 “We believe in the nose-to-tail philosophy – every part of the pig is used.” Each sausage is delicately marbled, offering a delicious ratio of fat to meat, which explains that melt-in-your-mouth juiciness while remaining incredibly lean. At least, that’s why we love them! You’ve got to try them out for yourselves. We carry her classic Kielbasa, Hot Italian Sausage, and Maple Breakfast varieties, so you’re covered for any sausage-loving occasion, from Sunday brunch and Rigatoni night to Oktoberfest.